Really friendly hosts and nice location next to the old town. They allowed us to leave the luggage at the hotel after check-out and they came back in the afternoon to let us change clothes and get our stuff for departure, which was very helpful. Thank you so much! The hosts were amazing picking us up from the port and letting us stay in the studio until 5pm prior to our evening flight. They picked us up again and took us to the airport all for a very good cost. The studios were great for our overnight stay. Handy for the port and the old town of Rhodes. Cross the park outside to the gate into the quaint walled iner city. The hosts are very polite and eager to help when asked. 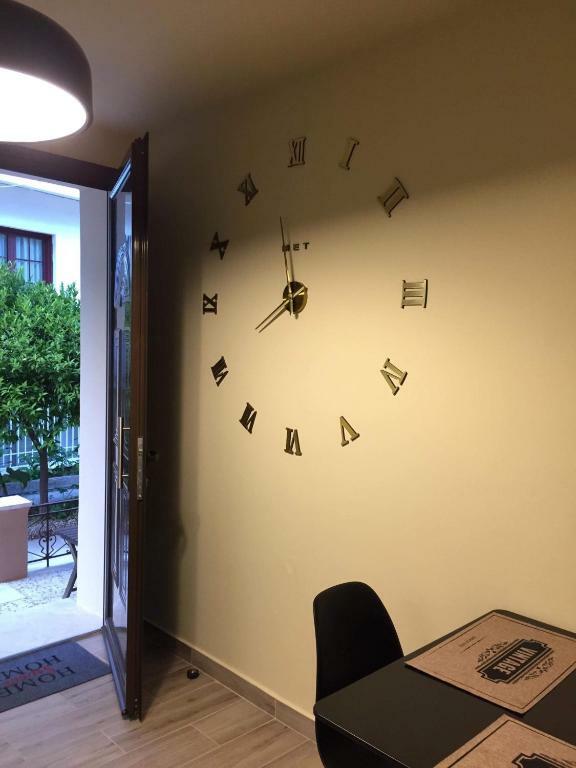 Very convenient location, close to the west part of the old town (10 minutes walking distance from the castle) and very close to the city center. Also, very convenient location for parking in case you rent a car. I had a very friendly greeting, the studio is an an excellent location right a across the street from the old city entrance, there is even a shop within 60 seconds walk. The studio is brand new, extremely clean with excellent air con. I would defo stay here again. bed was comfortable room was clean and bright. Stavros, the owner, was very very helpful and polite, efharisto poli! location is good, it is not far away from the old city. there was water heater, tea-coffee stand and the kitchen was good enough if you wanna cook your own meal. They way owners attended our requirements. They understood and did their best for we feel confortable. We are thankful for that. Studios are well located. There is a park just crossing the narrow street with nice, big trees. So, is a quiet place and you can enjoy having breakfast or dinner in the front yard. About prices, life is more expensives than in other Greek cities. There are very nice, clear warm water and quiet beaches along the island. For example, Tsampica and Lindos. If you like to walk, it is a good experience to climb up the hill, meet some goats and arrive to a small chapelle close to Tsampica Beach. Landscapes from there are great. In Lindos you can add the possibility for coming in to the ancient acropolis. Village is a very pintoresque white town. Rhodes old town is an amazing place. The old walls and port buildings are really interesting. And, of course, you must visit the main museum. It is a graet experience. We stayed in the smaller studio. It is good for 2. Location was perfect for us. It is close to the castle’s back entrance door, you can walk to the bus station as well. The room was clean and has everything you need for a small kitchen. On the front, there is a sitting area in the garden that you can use. WiFi was good. Area is lovely in the morning. House owners were really helpfull too. cool studio, all basics are included. the host is also helpful to recommend nice places to eat. Lovely clean apartment on the edge of the old city. Our hosts were delightful, kind and very helpful. Lock in a great price for Parko Studios – rated 9.1 by recent guests! One of our best sellers in Rhodes! Located in Rhodes, Parko Studios provides accommodations with free WiFi, a flat-screen TV and a kitchenette. An oven and fridge are also featured, as well as an electric tea pot. Popular points of interest near Parko Studios include Clock Tower, Grand Master's Palace and The Street of Knights. Diagoras Airport is 9 miles away. 뀐 Located in the top-rated area in Rhodes, this property has an excellent location score of 9.2! When would you like to stay at Parko Studios? This studio has a electric kettle, air conditioning and oven. House Rules Parko Studios takes special requests – add in the next step! Please inform Parko Studios of your expected arrival time in advance. You can use the Special Requests box when booking, or contact the property directly using the contact details in your confirmation. the bed was incredibly uncomfortable. We had a nightmare with mosquitos inside the room, both of us got badly bitten while we slept. Even though the window screens were kept closed 100% of the time. We had to spend our own money on plug in repellents. The flat was on the ground floor, so you can not sleep with the windows open which make it incredibly sticky. There are screens to stop bugs and flies ect, which do not work as mentioned above, but the screens have no locks and you can simply slide it open from the outside. We were there for 4 days, using the same towels we were given on arrival. We had to ask for clean ones. Plus we were told to take our own rubbish to the bins at the end of the street. No one cleans to room at all during your stay, to empty bins or give clean towels, nor change the bed sheets ect. Disgusting. The owner was nice enough when we arrived, but we felt like she could wait to get away and was not very helpful when we asked to store our luggage as our flight was at 9pm. We ended up finding a great place in the new town, another hotel, who kept our luggage all day for 5 euros plus a shower when we turned up to collect out bags. amazing service from stay hostel. Which looks really amazing actually,. We wished we had stayed there instead. location was good for the bus, and the old town. Nothing. Only small but very thought out and nicely decorated. Our reservation did not include room service (room cleaning, sheet/towel change); however you can ask for clean sheets and towels and the hosts will deliver them to you. I believe that the price range of this room would require room service to be included within the room facilities. unfortunately there was a construction nearby which was noisy. the park in front is a little dark and it makes the night walk a little difficult, but still we trusted in Stavros saying the environment is safe, and it seemed so. The room was a bit small for two people, but everything in it was new. First night was noisy. Other guestes were talking a lot at night. But this situation was corrected next day. The Bookings map to the property didn't work for us, making finding it at first a little tricky. The written street address is correct, of course. The room is a bit on the small side but it wasn't an issue for us because we didn't spend much time there.